I’d heard this tale several times on the Robert Elms show on BBC Radio London, not knowing if it is true or just an urban myth but when I saw that the theme for the Serco Illustration Competition this year was ‘London Stories’, it seemed a great opportunity to use it as the basis for an illustration. It was the 1960s and the Cuban government needed some new buses, red preferably. The political situation meant they had to look far afield for supplies. Their Minister of Transport, who at the time was Che Guevara, looked to socialist governed Britain and it’s state-owned motor company to supply them. The load was to be transported on an East German ship but the ship mysteriously sank on the voyage and never reached it’s destination. 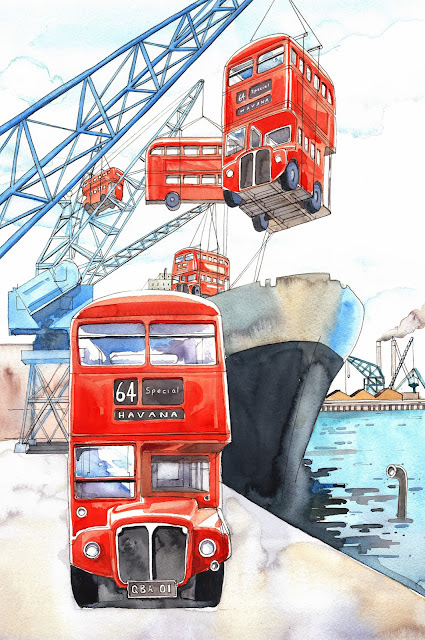 Whether there is any truth in it or not, I think it’s a fascinating story and I chose to illustrate the buses being loaded at the dockside. An utterly fantastic drawing! Good luck with the competition!